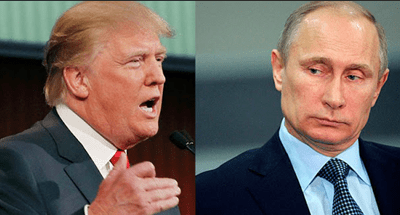 Russia's Vladimir Putin Praises Donald Trump As An ‘Absolute Leader" and "Talented"
You might think that for Donald Trump that there was no place lower for him to go than getting an endorsement by the American Nazi Party. Trump has now publically won the praises of vehemently anti-gay (and oft shirtless) Russian President Vladimir Putin! In a press conference in Moscow on Thursday. Putin called Trump a “a very bright and talented man” and “the absolute leader of the presidential race”. Another glowing endorsement for Donald Trump and the Republican party to be proud of. Back2Stonewall Movie Review: The Witch – Double, Double, Toil and OMFG! Can you imagine the outrage from t he repulsivecons if this had been about Hillary? These people are so ignorant.